This is our popular stock fuel filter delete kit for 1992-2000 Honda Civic, and 1994-2001 Acura Integra with b, d and h-series motors. If you will only be using gasoline then choose the 10 micron fuel filter. If you will be using e85 please choose the 6 micron fuel filter. 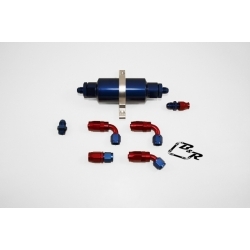 The 6 micron fuel filter is compatible with e85, gasoline, methanol, and alcohol. Note: Please give us a call if you need a custom kit.